India's first nuclear armed submarine is now ready for full fledged operations, having passed several deep sea diving drills as well as weapons launch tests over the past five months and a formal induction into the naval fleet is only a political call away. Multiple officials closely associated with the project to operationalize the INS Arihant nuclear missile submarine have confirmed to ET that the indigenously-built boat is now fully-operational and over the past few months, several weapon tests have taken place in secrecy that have proven the capabilities of the vessel. The Arihant, which is the first of five nuclear missile submarines or SSBNs planned for induction, has also undergone deep sea dives off Vishakhapatnam where it was build. A Russian diving support ship —the RFS Epron that arrived on October 1 — has been accompanying the Arihant on its deep sea dives and launch tests, officials told ET. The Epron — a Prut class submarine rescue vessel — was also the Russian representation for the recently concluded International Fleet Review (IFR) in Vishakhapatnam. India does not currently possess a submarine rescue vessel of this class - a vital requirement during weapon firing tests where all possibilities need to be catered for. The Arihant incidentally did nottake part in the IFR even though it was ready due to security concerns. The presence of 24 foreign warships, equipped with sensors and equipment that could pick up vital electronic intelligence being the main deterrent. 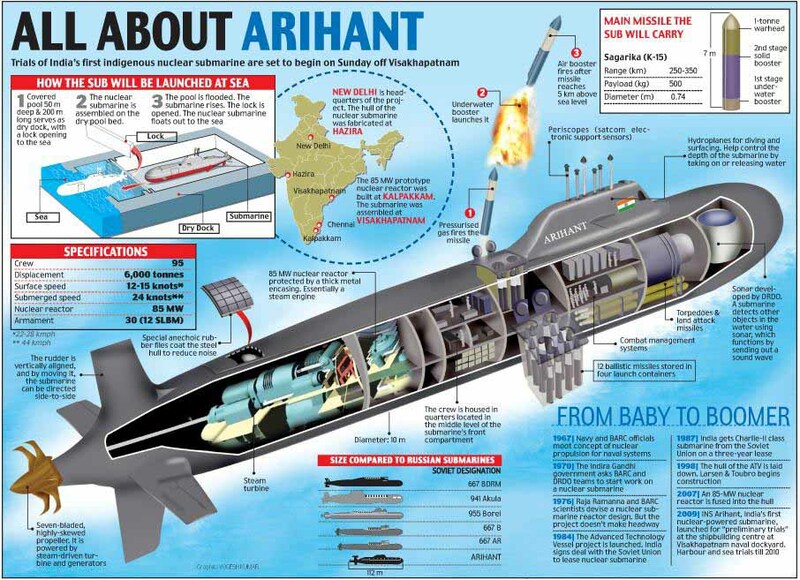 The Navy has managed to keep under wraps several weapon launch tests from the Arihant over the past five months. The submarine is to be equipped with K 15 (or BO-5) shortrange missiles with a range of over 700 km and the K 4 ballistic missile with a range of 3,500 km. "It has passed all tests and in many things has surpassed our expectations. Technically the submarine can now be commissioned at any time," a senior official said. Sources told ETthat the commissioning date could be as early as next month if the Modi government desires. A communication facility to interact with the submarine has already been commissioned into the Navy. At present, work is already in progress on two more Arihant class submarines at the Ship Building Center (SBC) in Vishakhapatnam which will be larger and more advanced than the first boat. The navy is also accelerating work on INS Varsha - a new strategic naval base with underground pens on the Eastern Coast near Kakinada - where the nuclear assets would be based. The Navy's Submarine Design Bureau is also presently working on a new class of nuclear powered attack submarines (SSNs) that it hopes to induct within the next 15 years. The plan is to build at least six SSNs in India, with financial sanction given last year for the project that could cost upwards of Rs 90,000 crore. At present, the only nuclear powered platform in service is the INS Chakra, a Akula class SSN on lease from Russia. With that Sagarika missile, this will be pretty much a useless weapon platform. How many targets can lie within the puny 700 km range of this missile? We need subs with ballistic missile range of atleast 5000 Km to be a serious power. The enemy should know that any nuclear mischief upon India will spell the end of their civilization and their entire way of life. This Sagarika missile won't be that assurance. Hope we will get a 5000+ km range of ballistic missiles on these subs. Last edited by Origmos; February 27th, 2016 at 10:31 AM. from a range of about 500 to 600 km away it can be used to target karachi or other coastal cities of pakistan . Long range missile for the submarine tested. kya re doctor, that is Russian Borei class ballastic missile sub. This sub most probably carries about 16 MIRV Sub launched ICBM's. Arihant on the other side carries 4 Mid Range Sub launched BM's. Last edited by BABU_HYDERABADI; March 9th, 2016 at 12:03 PM.